Polymer Gel Market Size will surpass USD 55 billion by 2024; according to a new research report by Global Market Insights, Inc.
Polymer gel market is projected to witness significant demand in medical industry by 2024. Hydrogels, which led the polymer (crosslink) gels industry in 2016, have been achieving rising popularity in drug delivery system, wound care, contact lenses, cosmetic surgeries and tissue engineering. Hydrogels have been used in moist dressings, as components of pastes for wound care and as debriding agents. Their high-water content allows vapor and oxygen transmission in various wounds & burns. The WHO has projected that by 2020, individuals aged 60 years and more in the globe will outnumber the kids younger than five. As a result, healthcare providers and governments will seek to sustain the quality of treatment and care provided in the coming years. These traits present brighter potential for crosslink gels in the medical applications by 2024. The modernizing agriculture sector will mark significant demand for super absorbent polymer hydrogels in the near future. The polymer gel market demand will be accredited to their superior properties such as: water saving, improving soil quality, reducing fertilizer applications and decreasing the irrigation frequency- thus resulting in stronger and healthier plant growth even under hot and dry climatic conditions. Aerogels will be the fastest growing segment in polymer gel market and will have high demand in contrast to the conventional thermal insulation (for instance, calcium silicate, fiberglass, expanded perlite, etc.) in the next 7 years. The high demand will be mainly attributed to the unique features of aerogels including: small space requirement, corrosion resistance, uniform performance in elevated temperatures, etc. Personal care & hygiene sector contributed to more than 50% share in global polymer gel market in 2016. Crosslink gel applications in this sector have been majorly in feminine care products, adult incontinence care products and baby diapers. Population escalation across the globe, rising living standards in the emerging economies, ageing population particularly in Japan and China will be some factors facilitating the scope for crosslink gels in personal care segment. Rising needs of sustainability will encourage the crosslink gel applications in various environmental applications. Hydrogels are having rising demand in industrial wastewater treatment, waste solidification in oil & natural gas drilling fluid & drilling mud, etc. Aerogels are used in filtration applications, for instance, in water filters to remove Naphta products (crude oil); in antimicrobial air filters for ventilators, etc. These traits present brighter growth aspects for polymer gel market in environmental applications in the near future. The processes for liquefaction and gasification of liquefied natural gas (LNG) have been the challenging services demanding industrial thermal insulation. Polymer gel market from aerogels products are projected to hold substantial demand with CAGR over 8% for insulation application in oil & gas industry by 2024. Space exploration is estimated to be a significant area of growth for aerogels by 2024. Aerogels are used as flexible, thin insulation in space suits, cryogenic insulation in space shuttle, etc. North America polymer gel market led the demand for aerogels in 2016 holding high share above 40% and is estimated to follow the similar trend by 2024. 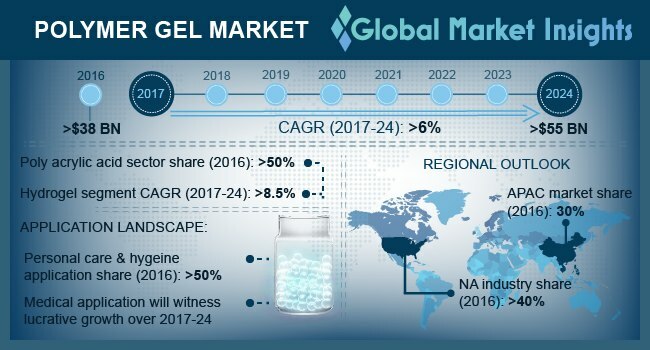 Hydrogels industry was led by Asia Pacific in 2016, which will also to see robust demand by 2024. Major manufacturers in polymer gel market include: BASF, Paul Hartmann, ADM, Evonik, Nippon Shokubai Co. Ltd., Buhler AG, ConvaTec Healthcare, SNF Holding Company, Chemical Industries, Ltd., Aspen Aerogels, Active Aerogels, Cabot Corporation, Aerogel UK Ltd, JIOS Aerogel, etc.